Acclaimed Israeli-born, NYC based jazz and Brazilian music influenced saxophonist and clarinetist. Anat’s most recent release came in March 2018 as a debut duo recording with the acclaimed pianist Fred Hersch, “Live in Healdsburg.” Her newest album as a band leader, “Happy Song,” released in October 2017, is another synergistic collaboration between Anat and Oded Lev-Ari. Born in Tel Aviv, Israel, she attended the Tel Aviv School for the Arts and the Jaffa Music Conservatory. Through the World Scholarship Tour, she attended the Berklee College of Music, developing a deep love and facility for various Latin music styles. Anat spent a decade touring with Sherrie Maricle’s all-woman big band, The Diva Jazz Orchestra. 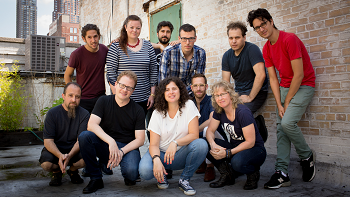 In 2009, Anat became the first Israeli to headline at the Village Vanguard, the setting for perhaps the most celebrated live recordings in jazz history, “Clarinetwork: Live at the Village Vanguard.” Of her Tentet, their music has been described as a “bursting sound, and infectious beat” and “gutsy, swinging” style.